Reasons to Buy: Incredible power & many features for the money. Notable Drawbacks: UI a little rough. No flash-based auto mode as found in other advanced models. Sigma's more advanced model. Has incredible power and many high-end functions at a mid-range price. There's no thyristor auto mode and while 8 steps of manual power control isn't paltry, with all of that power it'd be nice to have more flexibility. The increased power means the recycle time is relatively long. 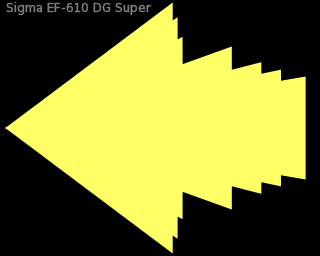 And the zoom reflector pattern is odd — the flash outstrips the competition at wide angle and when zoomed to above 50mm (35mm "full-frame" efl), but not at moderate wide-angles. Like the older EF-530 DG Super, the interface is somewhat complex and non-intuitive, but that may not be a big factor in your decision given all the other plusses.